It was one of those days I'll remember for a long time, for the wrong reasons. Even just getting to the car park resulted in a couple of wrong turns that ended up adding an hour onto the journey. And even finding the start of the walk took 3 attempts. This is not the start, it leads to a locked gate. The 2nd attempt took my up a driveaway and only then did I realise that there was a small sign and a path through some bushes opposite from the red phone box. 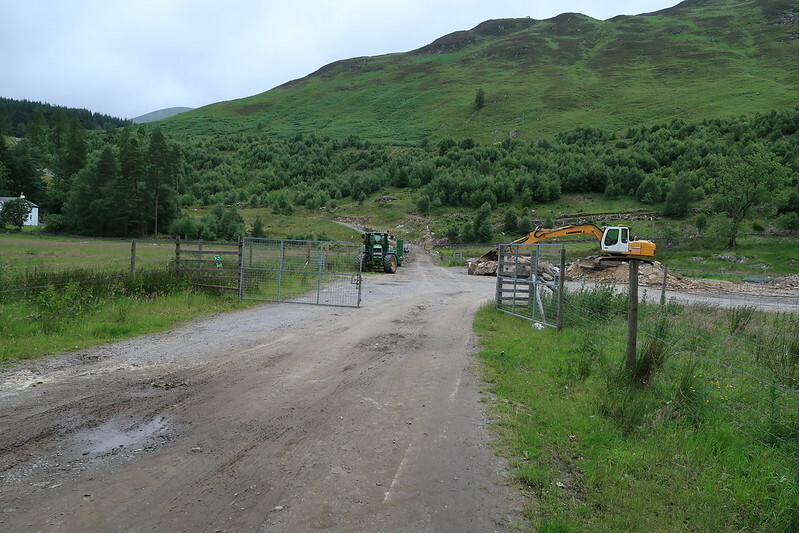 The path quickly ends up in the forestry works and the path trudges through wooden debris and through a couple of gates before you get onto a the track that comes up from the locked gate, it's not far before, following the marker posts, you head over a shoogly bridge and onto the path to the summit of Carn Gorm. At this point things were beginning to look up, the summits were in cloud but some of the lower tops were clear. And then the rain came on. And then the wind got up. At this point I'm not even at the top of Carn Gorm and I'm thinking whether to pack it in and turn back, but no, I've driven all this way. 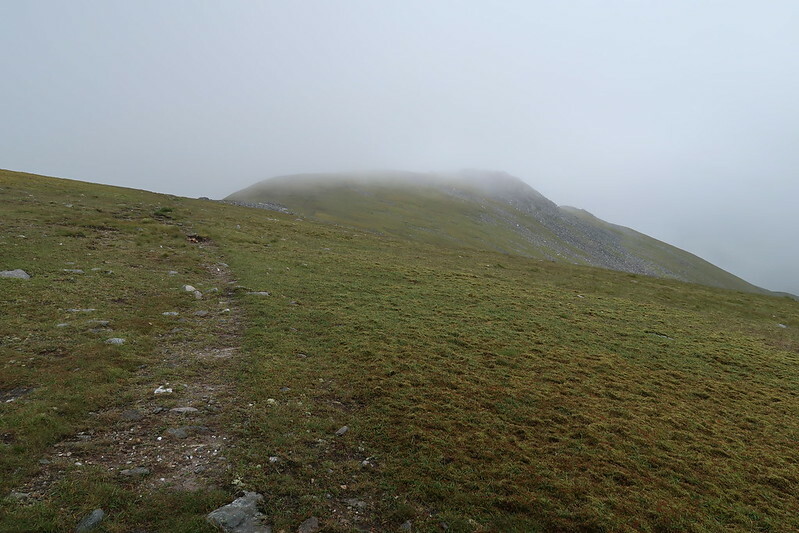 So I reach the summit and in thick cloud, don't bother stopping as it's a roaring gale at the top so take a bearing for the next top and head off deciding to head via An Sgorr and make decent progress to Meall Garbh. At this point this is where things start to go wrong. I've not stopped since leaving the car, always waiting for a break in the weather to make a stop for lunch. 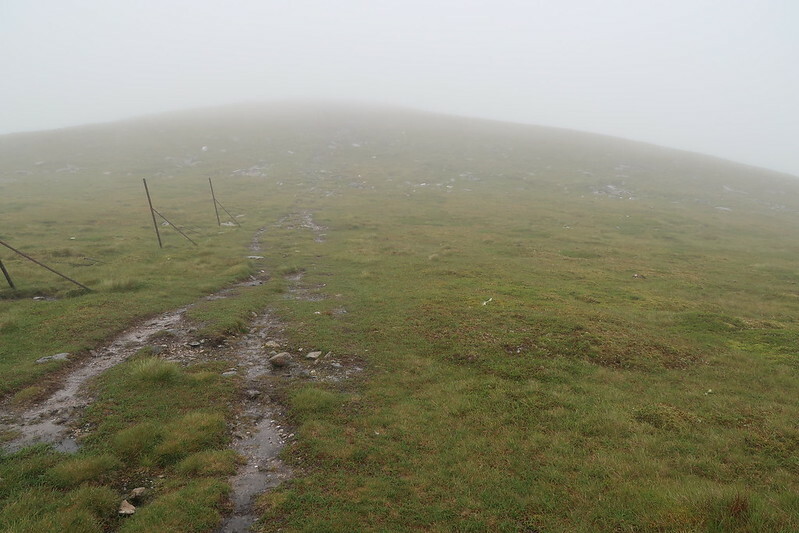 By this time I'm now hungry, wet and cold, but decide I need to eat and try and huddle down just off the summit to eat a soggy sandwich. Just stopping 10mins though sapped what heat I had left in my hands, but thankfully at last good fortune! I packed my spring skiing gloves in my bag the previous night (I've never felt the need to carry gloves during summer walking before), but my hands are now so cold and going white I'm struggling to get them on, but eventually do. Next was another mistake, rather than head of East, I somehow decided to head South. I can only assume the lack of food and warmth had affected my brain, but regardless I trudge off south with my boots now waterlogged and squelching with each and every step and head down the hill till eventually I'm out of the cloud and faced with a view that doesn't make sense as the route just continues to drop downhill without another hill in front of me. I briefly think that I've dropped down on the North side of where I should be but the lay of the land doesn't fit. But it does fit with having walked South from the summit. ****. At least I know what I need to do to get back on the right route, so I head back up into the clouds and then follow the contour round knowing that I'll eventually comeback on the path again. 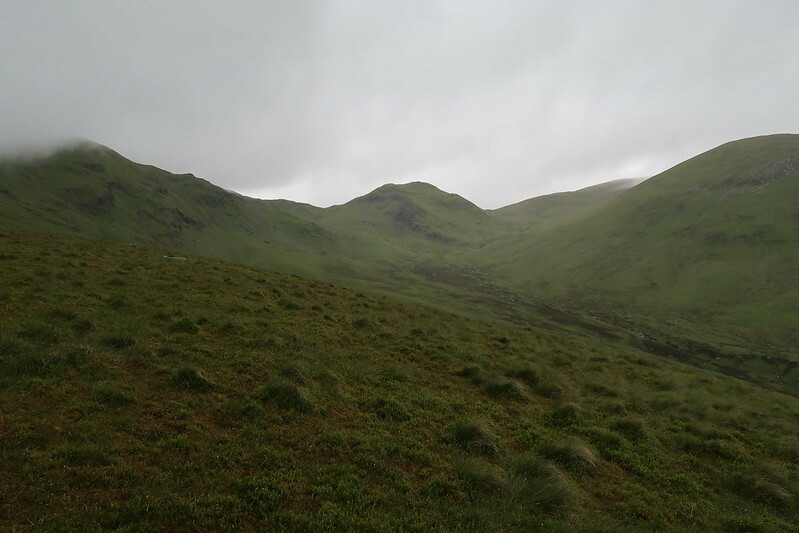 From here it was fairly straight forward to the next Munro Carn Mairg and just before the last climb up to the summit the rain stopped and cloud lifted enough to get a view of the top. 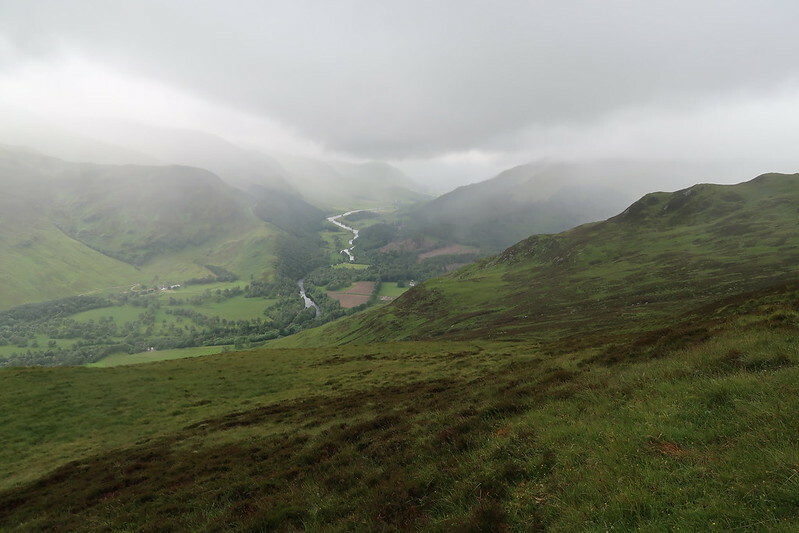 At this point the rain stops and the going is relatively good towards Creag Mhor, but still can't see a thing and just as I reach the summit the rain comes back on. Torrential rain. At this point I made my last error for the day. I followed the wrong path, rather than follow the path back to the way I came and then veer down the ridge line, I followed the path to the top West of the summit and then kept going. 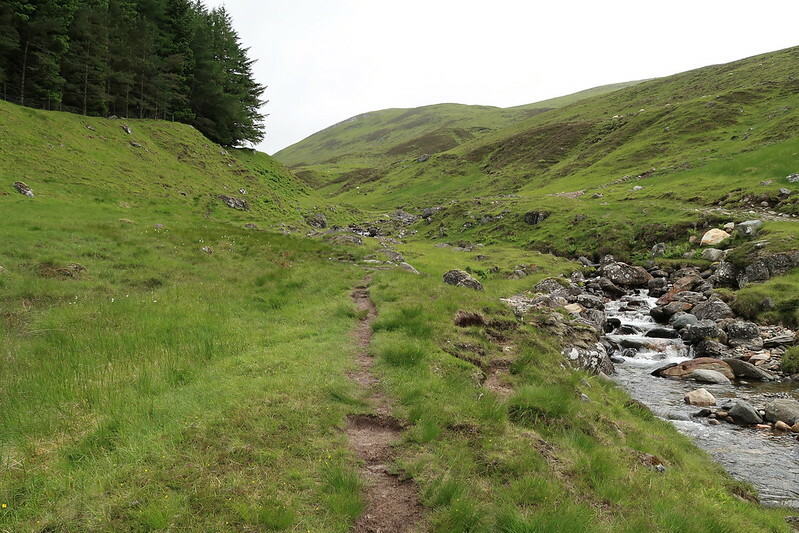 Eventually I come across a track that's marked on the map that takes you back towards the proper path down, but the descent through the heather on has taking it's toll on my thighs and the last uphill stretch is a killer. Boots have now dried off over a week later. Oh Brilliant - enjoyed that. Hillwalking is a bit dull if everything goes to plan.